East Bay Beach and resort. Although a bit more weather beaten than the beaches of Providenciales, South Caicos is home to quite a few beautiful coastlines. 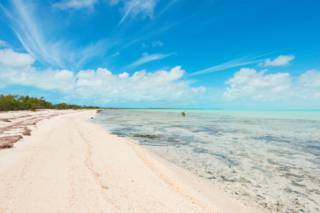 East Bay and Long Beach (Sailrock East Beach) are the finest coasts for general swimming on South Caicos, and offer crystal-clear turquoise water and white sand. 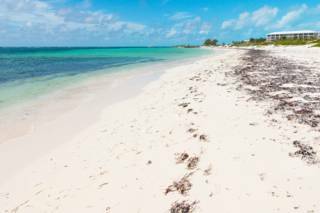 South Caicos is definitely home to varied and vibrant marine life, and exquisite snorkelling sites can be found at many beaches, however most sites are highly weather-dependent. When ocean conditions are calm, Shark Bay (Gannaway Bay), Highlands Bay, and Long Beach (Sailrock East Beach) offer the best snorkelling sites. 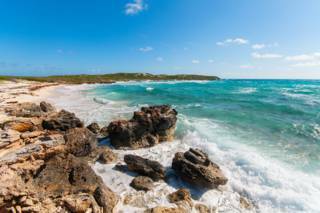 The eastern beaches and coastal cliffs of South Caicos are one of the greatest hiking and landscape photography regions in the Turks and Caicos. White marine limestone cliffs, reaching heights of about thirty feet in places, hide small coves and beaches. Highlands Bay and Valley Bay Beach are two of the larger beaches in this area. In addition to these sites, the ruins of Highland Estate and livestock wells can be seen inland close by. The extreme northern point of South Caicos, Plandon Cay Cut, offers truly unparalleled water hues, with breath taking ranges of blue, turquoise and topaz. Several different natural geological actions account for the amazing palette here. 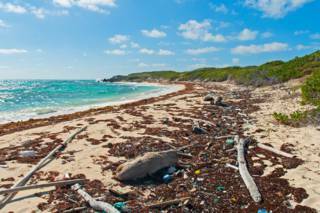 The entire east coast of the island is perfect for flotsam beachcombing. Because of the adjacent Turks Islands Passage and an unusual upwelling that takes place in the area, there's always interesting and strange finds to be had. Due to the largely non-existent tourism market on South Caicos, road signage and developed beach accesses are absent. Other than East Bay, all beaches on the island tend to be difficult to find, and many are only accessible by unpaved (and easily overlooked!) roads and tracks. We advise printing our South Caicos map for reference. Several of the beaches on South Caicos are difficult to access. Many are down rough dirt tracks that require a 4x4 to navigate. All accesses to the beach are free. All beaches are public, including beaches in front of resorts and private residences. Fishing without a licence or in National Parks is illegal and carries significant fines and possible jail time. This includes collecting conch and lobster. Secluded beaches carry an increased risk of crime. Don't leave valuables in your car or on the beach unattended. Read our Safety and Crime section for more information. Some beaches are very remote and there may not be any other people around to provide assistance in an emergency. Exercise caution and be aware of currents, surf conditions, and hidden hazards. The Cove Beach is located north of Bell Sound on the western side of the peninsular, nearby to Sailrock Resort. The Cove Restaurant + Beach Bar is also located here, which offers breakfast, lunch and dinner in a casual beach setting. Long Beach is located on the eastern coast of South Caicos, and is one of the island’s top beaches. 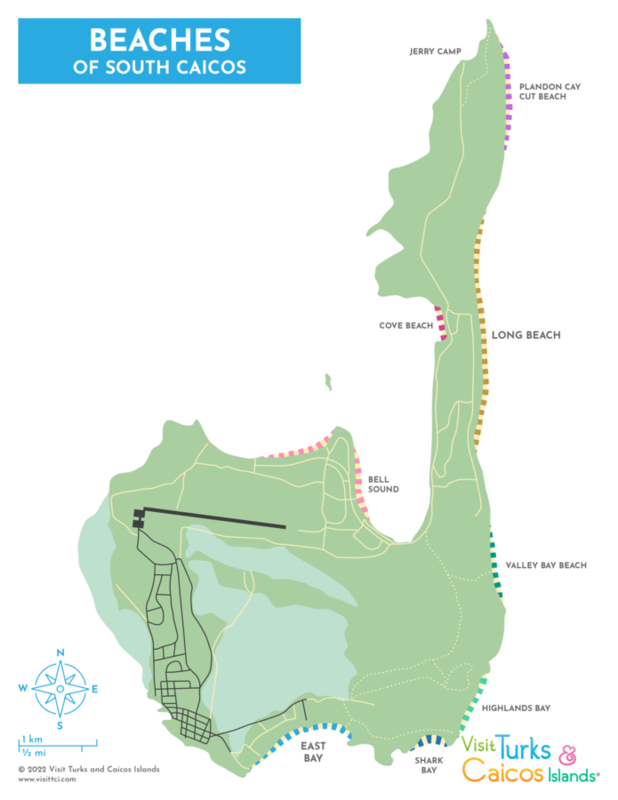 This area is great for swimming, beachcombing, and during calm conditions, snorkelling. The luxury Sailrock Resort is found here. 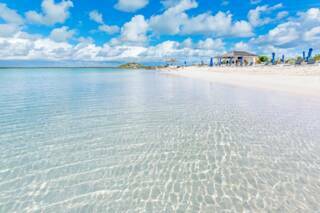 East Bay is the most popular beach on South Caicos, due to its general high quality, turquoise water, and ease of access. East Bay Resort is centrally located on this beach. 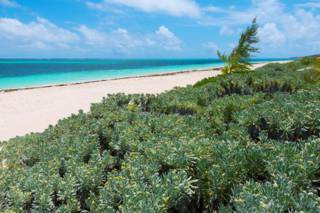 Plandon Cay Cut is located on the northern tip of South Caicos and offers one of the finest landscapes in the country. 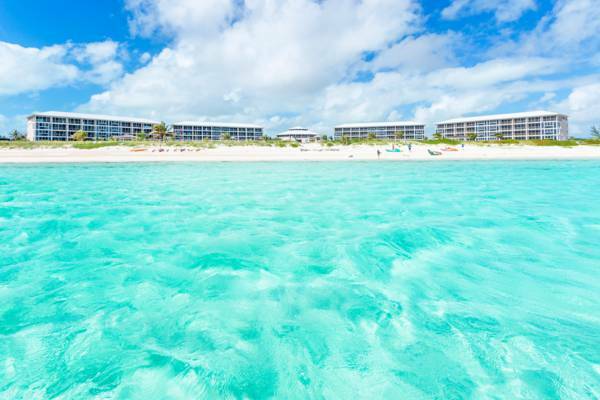 The vistas overlooks the channels and cays between South Caicos and East Caicos, and due to the varying depths of the water, the water varies from deep blue to light turquoise. The beach below the peninsula is decent, albeit a bit difficult to access. 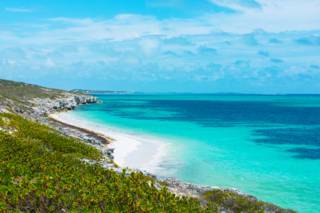 Bell Sound is a shallow and sheltered lagoon found off the north side of South Caicos. Due to the limited water depth, this sound isn’t a prime location for swimming, yet it scenic nevertheless. Shark Bay is a secluded and rugged cove on the southern coast of the island. Due to its windward location, the water here is typically quite rough. During abnormally calm conditions, the cliffs and reefs here make for a fascinating snorkelling site. The attraction of Valley Bay Beach is largely the amazing views seen from the rolling hills above the coast. This remote beach is a great hiking location, and is adjacent to the highest point on South Caicos. 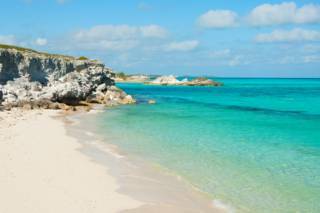 Highlands Bay is another hidden beach on South Caicos. Actual swimming conditions aren’t optimal, yet the area offers beautiful landscapes, great beachcombing, and when the ocean is docile, impressive snorkelling reefs.